Don’t settle for a job half done. Combine the power of Pure Storage with Cohesity DataProtect to complete your end-to-end storage transformation. Together, Cohesity and Pure give you all-flash speed and web-scale data management, in one integrated solution. Use FlashArray snapshots for fast, non-disruptive data protection. Protect FlashBlade with scalable, high-performance file protection. Cohesity integrates natively with Pure Storage FlashArray to improve snapshot-based data protection. 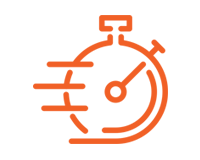 Dynamically tier snapshots between Pure Storage primary storage and Cohesity secondary storage to provide the best possible data protection. Store the most recent snaps on FlashArray for faster recoveries. Move long-term snaps to Cohesity for efficiency and scale. 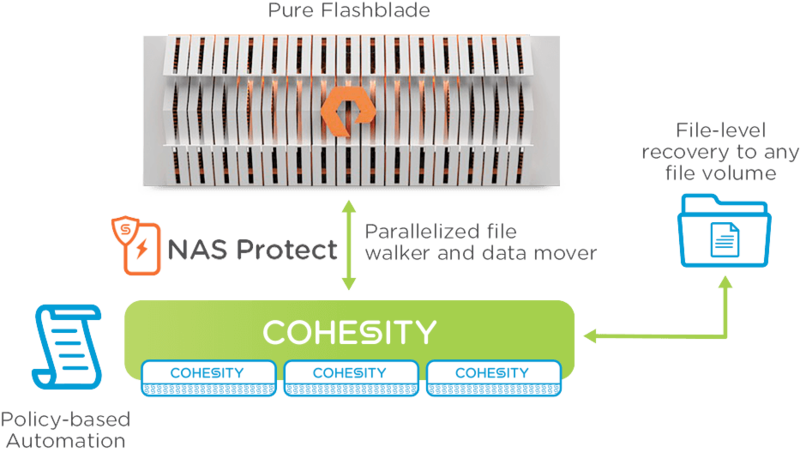 Cohesity NAS Protect integrates with Pure Storage FlashBlade to provide simple, high-performance, scalable data protection for FlashBlade. Complement your Pure Storage environment with the Cohesity web-scale secondary storage platform to simplify data protection, accelerate recovery times, and reduce costs. Integrate Pure Storage directly with Cohesity for efficient data protection and simple management. Protect and move data directly from FlashArray and FlashBlade to Cohesity. Protect files stored on FlashBlade to Cohesity with simple, high-performance, scalable solution. Keep your long-term data on Cohesity with best-in-class TCO and space efficiency to reduce overall data protection costs. Eliminate traditional data protection silos with a simple, converged data protection platform. Automate data protection across FlashArray, FlashBlade and Cohesity. Create policies in Cohesity and assign those policies to individual applications or volumes for complete end-to-end automation. Recover data stored on Cohesity to any FlashArray or FlashBlade system. Data can be recovered not only to the original primary storage system, but also to an alternate system located either in the same datacenter or in a DR site. Integrate natively with the public cloud for archival and replication. Use Cohesity to archive or replicate your data to AWS, Microsoft Azure and Google Cloud. Reduce the cost of data archival and disaster recovery. “Cohesity’s direct backup of Pure FlashArray//m snapshots provides another layer of data protection for our mission critical apps that’s easy to use from the Cohesity DataProtect administrative console”.